Formatting pages is driving me buggy! Everything I add goes to the top and move doesn't seem to work. 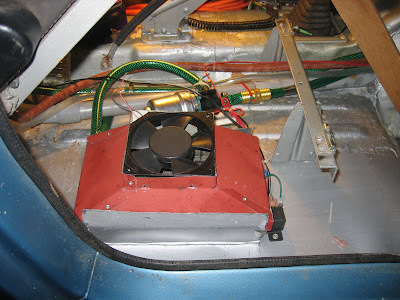 So here's the completed cooling system. Finding a fan proved difficult. My neighbor was using this in his office and donated it to the cause. Big radiator fans are available and little computer fans, but I needed one around 6". 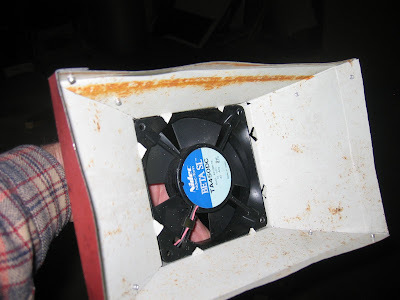 I made a shroud to fit the fan to the radiator. 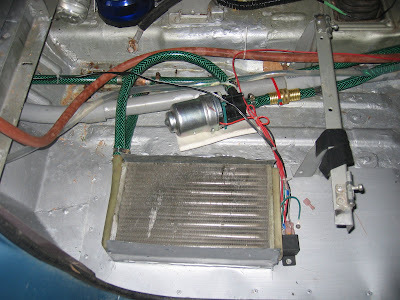 I cut a hole in the floor under the passenger seat and installed a radiator. I t hink it was a heater core. I found a pump on Ebay that was being sold to the hydrogen generation for injection crowd. The relay in the front of the radiator turns on the pump and fan when the thermostat in the battery box turns off. Hope you can see what I did in spite of the formatting problems.